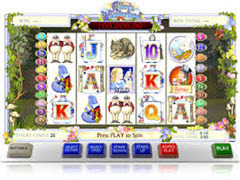 Alice in Wonderland Pokie Review - Play today! A Mad Hatter tea party with an unwanted marriage proposal is what convinced Alice to follow the rabbit with the cutest little blue waistcoat, what followed is a fairytale of discovery, as she falls down a huge rabbit hole. Ash Gaming offers this adventurous slot with 20 paylines on 5 reels with a wide variety of miraculous features. Mad Hatter’s Tea Party Bonus, Rabbit Hole Bonus, Pocket Watch Bonus, Free Spins, Progressive Jackpot, Wilds, Scatters and Sticky Wilds are all part of the features offered by this game. Underland is excited by this new arrival and wonders if this is indeed the “right” Alice, as she would be able to slay the jabberwocky red queen, which will restore the power of the white queen. Alice discovers a whole new world with exciting new friends, white rabbit, tall flower, tweedledee and tweedledum and dormouse to overcome the challenges in this journey of fantasy. Join wonderland with coin denominations ranging from $0.01 – $25.00. $500.00 per spin is the highest available option in maximum bet. A wonderland unfolds onto your screen, the background, a butterfly haven with mushrooms peeping through the grass and colourful flowers complete a green vine frame. Beautiful illustrated symbols includes Alice, Mad Hatter formally dressed, rabbit hole with a green little door, white rabbit checking the time on his golden pocket watch, tweedledee and tweedledum, Cheshire cat, caterpillar and the symbols are completed by wonderfully illustrated poker symbols. Alice in Wonderland includes the most wonderful features starting with Alice standing in as the wild symbol and substitute for all symbols excluding the rabbit hole symbol, white rabbit and the mad hatter and cannot activate the rabbit hole bonus game, pocket watch bonus game or the mad hatter’s tea party bonus game. 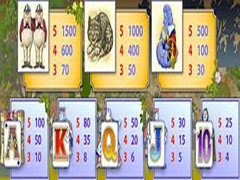 Mad Hatter’s Tea Party bonus game will trigger, when a minimum of 3 to 5 mad hatter’s symbols appears anywhere on the reels. These mad hatters symbols will not give you any winnings, but they will magically allow you to progress to the Mad Hatter’s Tea Party game, which is a guaranteed win. On entrance into the mad hatter’s bonus game you will be aware of 4 guests, Alice, the hare, mouse and the mad hatter. Choose one of the guests to share some tea with. Your winning will be determent by the amount of time your chosen quest takes to drink tea. You would have the option to give another guest the change of having tea; once a guest is finished they will cover their cup with their hand. Choosing guests will continue until all 4 of the guests have enjoy some tea. The total winning will be added to your winnings. Progressive Jackpot will be awarded if any of the guests adds sugar to their tea before drinking it. This shall be indicated by a moving spoon between the tea cup and sugar pot. The bonus game will continue even if these events takes place and the progressive winning will be added at the end of the bonus game. The Rabbit hole bonus feature will appear on the 3rd reel, once the rabbit hole appears you will immediately progress to the bonus game. This bonus game let Alice fall down the hole, finding prizes on her way. Once Alice has fallen all the way the prizes will be added together and to your winning. The bonus game requires no player participation. The Pocket watch bonus game will be activated once the white rabbit appears on the reels. This bonus game will award free spins. During the pocket watch bonus game the white rabbit will check the time on his golden pocket watch at random and where it stops it will reward that amount of free spins. The reels will be enhanced during the free spins, which will set off more winning opportunities. The free spins will continue automatically and once completed you will be back to normal play conditions. Alice in wonderland is a masterpiece game, offering three bonus games, which is exciting, theme related and a pleasure to play. The graphics is as wonderful as the theme and this adventure reaches a full 10 on the fun meter.